I have so many things to do at the moment. I’m curating an exhibiton for Fringe, plus designing, building and rehersing for a seperate show, I’m studying full time (and you should SEE the amount of procribed readings, let along all the other readings I’m doing on my own) and I hardly have time to sit down. Big West will be staging a large-scale knitting project as part of its 2009 Festival that will transform the landscape of Footscray from November 20 – 29. So we need to get knitting! We welcome anyone with a passion for knitting, from beginners to experts. Individuals and groups are welcome. How could I say no? I didn’t get to the info sessions, but I did email and recieve replies from Karen, the festival director. So I’m busily knitting in all my spare time. Which is pretty much on the bus and walking to class. This was walking to the bus, travelling to uni, walking to class, walking back to the bus stop, travelling back and then walking back home. Look how much there is! Travelling, people, it’s wasted crafting time! I’m telling you! I love the bottom right hand corner, it’s hard to see (damn missing camera cord again! 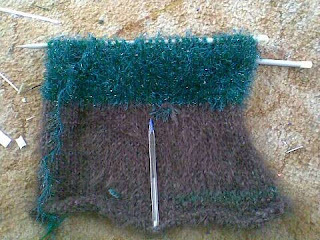 I swear, I’m going to superglue it to the freaking computer, so this is a camera phone image again) but I grabbed some spare wool and there was less than a metre in a random green, so I knitted it in and was really, really pleased with the colour combination. The large amount of what I’m going to call ‘tinsel green’ is left over from some grass I knitted for the play we took to Edinburgh Fringe, although I’m not sure it was ever used. And I’m also crocheting an orange and brown small rug for that 70s retro feel. So hilarious!